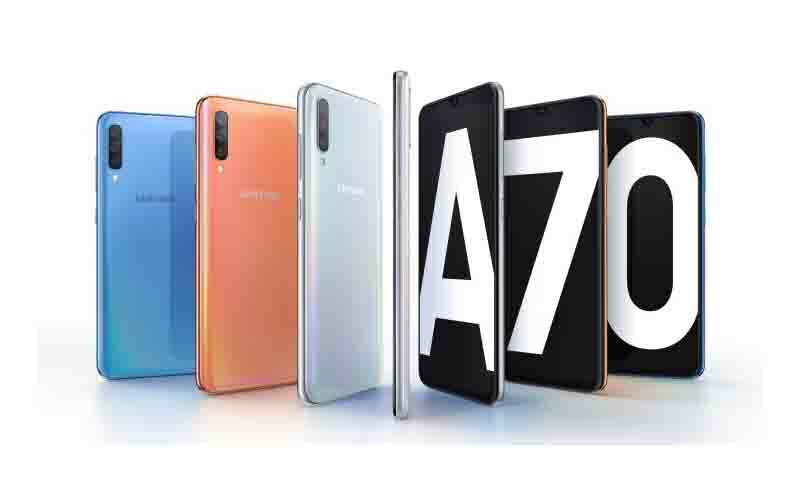 This month, the South Korean electronics giant Samsung already and unveiled two Galaxy A series devices; the Galaxy A20 and Galaxy A40 and today the company has launched yet another device in the ‘A series’ which is called Galaxy A70. So, let’s check out the specifications, pricing, and availability details of the device. The smartphone sports 6.7-inch Infinity-U Super AMOLED display with 2400 x 1080 pixels resolution. The device is powered by octa core Snapdragon 670 processor and paired with 6 GB and 8 GB RAM along with Adreno 506 GPU for the graphical task. In terms of storage, the smartphone has 128 GB of internal storage and that can be expandable via micro SD card. Moving to the photography department, the Galaxy A70 rocks triple rear cameras and that is in the combination of 32 MP primary sensor with an f/1.7 aperture, an 8 MP f/2.2 ultra-wide-angle camera with a 123° FOV, and a 5 MP f/2.2 depth camera sensor, along with a 32 MP front camera with f/2.0 aperture. The smartphone supports the in-display fingerprint scanner along with the traditional security features. Moreover, it also comes with the Samsung Pay, Bixby, and Night Mode. Talking about the connectivity options, it supports Dual SIM, 4G VoLTE, WiFi 802.11 a/b/g/n (2.4 GHz / 5 GHz), Bluetooth, GPS, and USB Type-C port. The Galaxy A70 runs on Android 9 Pie with Samsung One UI, and ships on 4,500 mAh with 25W Fast Charging. The pricing and availability of the device haven’t revealed yet but we recommend you to stay tuned with us for the updates.